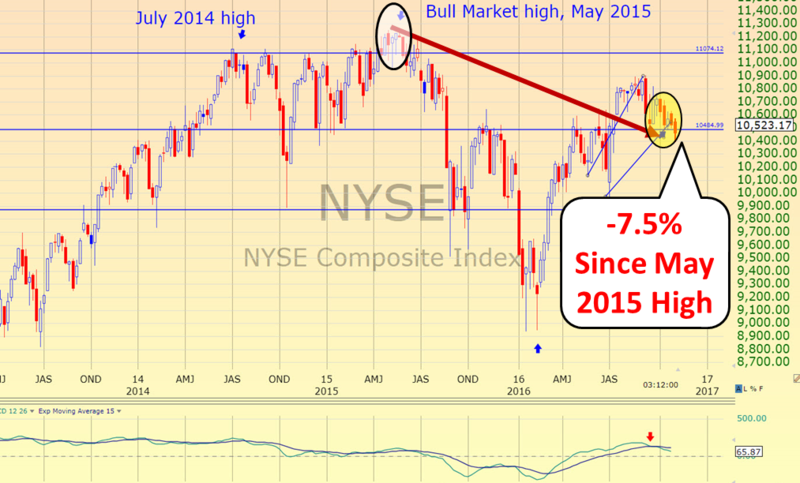 The major indices have not made any progress over the past 3 months. Most people only watch the Dow Jones Industrials Average (30 big-cap stocks) or the S&P 500 Index (500 stocks). Both indices made new all-time highs this past August. So all is well in the markets, right? But look closely at the chart below. 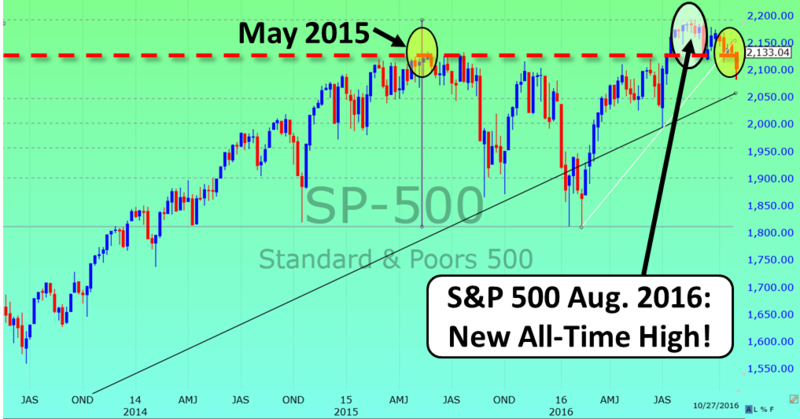 Since making its top two months ago, the S&P 500 index is now below the level it was back in May 2015. More importantly, the much broader NYSE Composite Index (over 2000 stocks) is currently where it was back in April 2014. That’s 2.5 years with no gain for the average stock. You see, while the S&P 500 index made new highs since May 2015, the NYSE Composite is actually down 7.5% since that time. This is incredibly important. However, there is one big challenge ahead for investors: the election! Right now we are seeing signs in many of our indicators revealing that the big “smart money” is already preparing for what’s likely ahead. As you can see from these two charts, there are major divergences between the “popular” indices (S&P 500) and the broader, more significant index (NYSE), which tells you how most stocks are currently trending. We believe right now is the ideal time to prepare your own portfolio ahead of the market turmoil. Of course no one can guarantee who will win the election, but even if you knew who will win, would you know how to position your investments to protect or even profit from the outcome? You see, we interpret clues like the above from a variety of markets on a daily basis. When these clues confirm our indicators, we take immediate action. That’s how we have been properly positioned for sharp declines, and then made the change to participate in the next market or sector rally. What service can do this for you, notifying you instantly once we make a shift in our positioning? That service is our revolutionary new HedgeFolios program, where you have our continuous guidance by your side. We monitor the investment markets throughout the day to ensure our model HedgeFolios are positioned advantageously. When we see our warning signals flashing and confirming other clues, we can make shifts in our HedgeFolios and instantly notify our members, who will then implement the same changes in their own account. With HedgeFolios, you can easily replicate our model portfolios with just a click of the mouse. It can’t get any simpler! 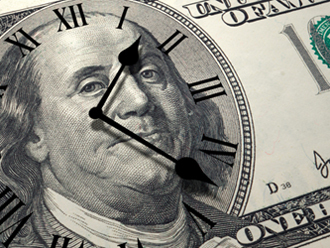 So ask yourself, do you have the time to monitor your investment portfolio every day to prevent significant losses? More importantly, do you have the professional guidance needed to protect you and your investments? The answer for many investors is “no.” This is exactly why we created HedgeFolios, which makes following our professional investment analysis, research, and market timing incredibly simple and convenient. You update your portfolio with one easy mouse click to replicate our trades. You don’t have to enter individual orders for each position. You don’t have to calculate number of shares or dollar amounts for each position. It’s all done for you. You know at all times where your money is invested. Your choice to invest in any of our 5 HedgeFolios. You can switch from one HedgeFolio to another at any time, if your investment goals change. You have our 40+ years of experience analyzing the markets on your side. You receive our advanced technical analysis and market timing, provided through our model HedgeFolios. All HedgFolios are designed and continually monitored by Bert Dohmen and Dohmen Strategies. With HedgeFolios, no one except you has control over your money. You never have to wonder where your money is or what investments you hold. Most important, you don’t have to sign a “power of attorney” which is required for money managers. (We are not, and have no plans to be, registered money managers). 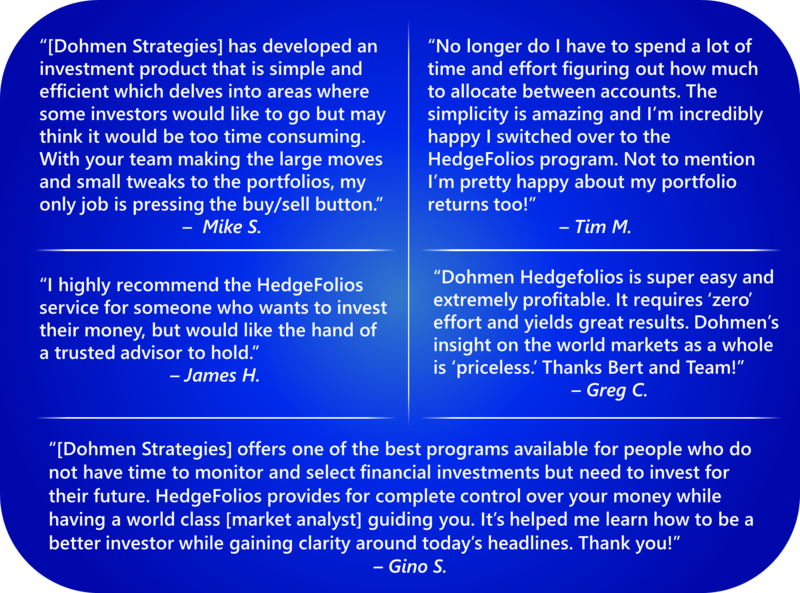 All you need to do is sign up for your HedgeFolios membership, which gives you access to all 5 of the HedgeFolios, and then choose which of the HedgeFolios you would like to replicate in your own account. It’s incredibly simple and convenient for any investor. Join our HedgeFolios program now and simplify your investing in a convenient and time-saving approach. It may be the best investment decision you make this year. P.S. SAVE 25%: If you sign up to become a member today, you can receive the 25% discounted Platinum Member rate. Or you can choose the brand new Gold Quarterly Membership (a 15% savings). But remember, this special pricing is available for a limited time only, so act now.